An image is worth a thousand words and sending it by E-mail is so easy: send us pictures of the stern of your boat, the cockpit and lazarette area, its steering gear, belowdecks if needed. We will suggest a model and its installation, and tell you what and where to measure to build a gear that will fit your boat perfectly. Note: when this was written, video equipment did not attain the quality it does nowadays. As soon as I made the decision to work at preparing this single-handed non-stop voyage from Saint-Malo, in France, to Gaspé, Québec, the other way around the world by way of the Roaring Forties and Cape Horn, I also tried to find how I could share the most intense moments with those I love. It happens that I grew up and spent 15 years of my professional career in the field of the performing arts, first in theatre, then in television and finally cinema, working as an actor, director, or production manager, often in more than one of those functions simultaneously. I had had the pleasure of seeing Voyage au bout de la mer, the unforgettable film that Bernard Moitessier brought back from his Long Way. However, I had been left on my appetite: the sound track of the film was made after he came back. I saw that in order to convey as faithfully as possible what the single-hander experiences, it would be equally important to record sound as to shoot images. If, other than shooting subjective images like Moitessier, I spoke simply to a camera and described the various events as if I was talking to a sailing buddy, I could probably give the impression the viewers are sailing with me aboard Jean-du-Sud. I wanted to make a film that I could project on a screen in a theatre, so this ruled out using video equipment. I would shoot 16 mm film, with sync sound. And I was sure there would be enough events during the voyage to hold the viewer’s attention for an hour and a half, the normal duration of a feature-length film. 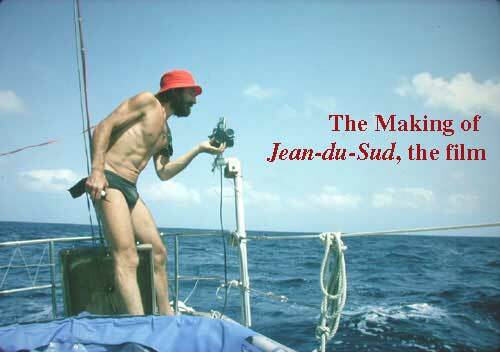 I believed, naïvely enough, that the funding I would find for the film would also allow me to equip Jean-du-Sud for the voyage. After a few months spent in Montréal trying to reach a production agreement, I had to face reality: I would consider myself lucky if I raised enough money to purchase some film and equipment. The voyage itself had to be financed separately: in exchange for messages broadcast daily from Jean-du-Sud, the Montréal radio station CKMF and other stations of the Radio-Mutuel network provided what I needed to equip and provision the boat. From the start, Robert Roy, responsible of external production and Philippe Lorrain, responsible of film purchasing at the French network of Radio-Canada, favored the project: Mr. Lorrain, a sailor himself, knew me as such and Mr. Roy knew me as an actor and filmmaker. I do not remember which one of the two said that if a Quebecer attempted such an adventure, he should be encouraged and given the benefit of the doubt. The most difficult was finding a producer who would stake his reputation and financial responsibility in such a risky venture. Helped by Yves Michon, I was able to convince Jacques Pettigrew into engaging his production company. Before starting Ciné-Groupe, he had shot the film Cap au Nord that narrated sailing through the North-West Passage aboard the 35 ft cutter J.-E. Bernier II. Thanks to the obstinate support of Jean Roy, the National Film Board of Canada lent us the film and sound equipment: two Arriflex 16 S cameras, one case of lenses, one Nagra tape recorder and some microphones. The Arriflex is a quite robust camera, but I saw right away that I could not use it in heavy weather. Even if I tried protecting it with plastic bags, its electric motor would not resist very long to being doused with seawater. I insisted with Ciné-Groupe and at the Cape of Good Hope rendezvous, they brought a small, robust spring-driven Bell-Howell, that I could dare bring topside in heavy weather. After this, I used the Arriflex only for sync sound shots. Almost all hand held shots were done with the Bell-Howell. For shots with sync sound, the Arriflex could be fastened in different places on the boat. In fact, I ended up using only four positions, two topside and two below: at both ends of the cockpit and at both ends of the cabin, on the same side. I was afraid that repetition of the same angles would bring monotony, but the different conditions of weather, sea, light or the subject itself were different enough from a scene to the other to avoid any sense of déjà vu. Camera support for the first leg was quite crude: a piece of aluminum tubing fastened to the stern pulpit or to a bulkhead, on which an other short tube was articulated. To hold the camera, I simply had a bolt welded to a vise-grip: the bolt was screwed into the base of the camera, locked in position with a locking nut and the vise-grip would bite the aluminum tube. I was trying to imagine a way of taking the camera out of the boat. As I was walking in front of a shop that sold kites, I had an idea: I went in and asked if a kite could be powerful enough to fly a small camera; the owner showed me an american magazine about kites, in which an article about a meeting of amateurs of aerial kite photography mentioned the name of Lucien Gibeault, a photographer from Valleyfield, Québec. I contacted him and it turned out that he had found at this meeting that he was among the most experienced on the subject. He told me all he had learned and presented me with two beautiful kites of his fabrication. I already had the ideal camera for this: a small Kodak Cine-Magazine, weighing only two pounds, which my father had purchased the year I was born for shooting home movies. I had no film to waste: I left with only 17 hundred-foot reels, this all we could afford. Furthermore, if I wanted to do a second take, I had to bring the camera inside to reload, and re-do the framing from the start; consequently, almost all the scenes in the first leg were done in a single shot. I used 36 reels in total; once edited, Part One is 1800 ft, which makes for a 2:1 ratio only. Nearing the Island of Madeira, I met an other yacht, which, contrary to me, was stopping there and I was able to give him my first 6 exposed reels for mailing to Montréal . Once processed, they reassured the people at home who still doubted of my ability for shooting good footage with synchronous sound, alone aboard a boat and proved there could a film after all. Two rendezvous at the Cape of Good Hope and in Australia were organized to exchange footage shot for fresh and shoot complementary scenes. I was setting up the jury mast, after being dismasted, when I had the idea of a small helmet camera: I would have liked to shoot the scene, but I had my hands full already; but if I had a small camera with a wide-angle lens, I could shoot anything, even sail changes in heavy weather. During the first leg, I almost did not think about the film: I shot spontaneously, when light was good and something worth sharing was happening. As soon as the scene was in the can, I tried to forget about it and re-discovered the film when I screened my footage after I had flown back from the Chatham Islands, following the dismasting of Jean-du-Sud. Normand Allaire had already started working on cutting the film and I saw right away I could trust him completely: he gave the film a structure both poetic and dramatic, pushing friendship as far as joining me at the Chatham Islands to shoot the last images of the refitting and the second departure of Jean-du-Sud. Filming this second leg was very different: I had edited Part One and become conscious of the need not to repeat myself and further synthesize the essential of the experience. I even took the trouble of writing some scenes ahead of time, carefully choosing each word in an effort to transmit as precisely as possible what I was going through, and then delivering them to the camera. This time, I had much better equipment at my disposal: first a small camera mounted on a helmet, protected from salt spray, with a 5.9 mm lens that gave it a very wide field of view, with the added advantage of a depth of field from 18 inches to infinity. With this camera on my head, I could shoot whatever I wanted. I was even able to swim away from the boat and climb to the masthead with the camera on my head. I had a waterproof bag made for the Bell-Howell, and a camera mount that allowed me to come back to the same framing after I had reloaded the camera. We also spent a lot of energy fabricating a gimbal mount stabilized by a gyroscope that was supposed to keep the horizon almost stable, while the boat was moving up and down in the foreground. But the seas of the Roaring Forties were stronger than the inertia of the gyroscope and I could not use the mount. For recording the sound, I used for this second leg a small Walkman Professional cassette recorder made by Sony (WM-D6), with a small lapel microphone (ECM-16T, also by Sony). Besides being high fidelity and very compact, this recorder had a quartz motor that was practically synchronous with the camera. My film stock allowance was more generous and I shot more film, but not more than a ratio of 4 : 1. I had judged that for flying a kite from the cockpit of Jean-du-Sud and have a wind as strong as possible, it should come from forward of the beam (it came from behind, I would need to fly the kite from the forward deck and blanketed by the sails, it would never take off). Consequently, I had decided from the start that I would play with my kite on my way back, as I would be sailing up the Atlantic close-hauled in the Southeast trades. The technique is as follows: the kite is launched and about 50 meters of line are let out (if the wind is light, a second kite is launched on the same line). If the kite flies nicely, the next step can be considered; otherwise, more line is let out. The camera is then attached; to ensure that it is pointing in the right direction, it is oriented along the line, which points to the boat. I had overlooked the problem of triggering the camera and after experimenting with various methods, I came up with the solution of a sheet of paper folded in the shape of a fan, clipped around the line: pushed up by the wind, it came in contact with a mechanism made with aluminum wire and rubber bands that triggered the camera. I attenuated possible jerks by accelerating camera speed to 76 frames/second. We fancied ourselves his sailors.